Unconventional gas is produced from coal seams, shale rocks, and rocks with low permeability. Gas produced from these reservoirs has the same properties of gas produced from conventional, i.e. sedimentary reservoirs with high porosity and permeability. Unconventional gas may have high levels of natural gas liquids, low or high levels of carbon dioxide, and high and low levels of sulfur. The federal government of the U.S. has been promoting investments in exploration of unconventional gas through public-private partnerships. The Federal Energy Regulatory Commission has approved a charge on interstate gas sales to fund gas technology R&D. This has accelerated investment in R&D in the unconventional gas market. Discovery of new natural gas reserves, especially in the U.S., China, Argentina, and Canada, offers significant potential for the unconventional gas market. Hydraulic fracturing technology is largely used for the production of unconventional gas. Hydraulic fracturing is a process of injecting chemicals, water, and sand at extremely high pressure into gas wells in order to fracture rocks and release methane gas, The process takes place over two to five days, and requires an average of 5.5 million gallons of fluid. It may be repeated multiple times on the same well over the course of the potential 25 to 40 year lifetime. Many of these chemicals are toxic and are known to cause adverse health effects. Many of the chemicals used in hydraulic fracturing can cause eye, skin, and respiratory problems, and can also affect the brain, nervous system, and gastrointestinal system. This is expected to hamper the unconventional gas market. Applications in the natural gas industry have been expanding significantly. Natural gas is being increasingly used as an energy fuel in transportation and domestic, i.e. residential and commercial, sectors. The transportation sector has boosted the natural gas market, with rise in deployment of CNG vehicles. More than 24 million natural gas vehicles (NGVs) were operational across the globe in 2017. Natural gas can be used in all classes of vehicles such as motorcycles, cars, vans, light and heavy duty trucks, buses, lift trucks, and locomotives. This trend is expected to continue during the forecast period, thereby propelling the unconventional gas market. In December 2017, TechnipFMC plc. launched the Surface International Facility Center in Abu Dhabi, the UAE. The company aims to provide solutions and services to the Abu Dhabi National Oil Company (ADNOC) and other companies. The center is expected to strengthen the business outlook of TechnipFMC plc. in the Middle East. In October 2017, TechnipFMC plc. announced plans to enter into an agreement with Plexus Holding plc. to acquire the latter’s wellhead exploration equipment and services business for jack-up applications. The acquisition is anticipated to further extend and strengthen TechnipFMC plc.’s position in exploration-drilling products and services. In June 2017, Total S.A. acquired an additional 75% interest in the Barnett shale in the U.S. Through this move, the company aims to expand business in North America. In June 2016, Det norske oljeselskap ASA (Det norske) entered into an agreement with BP p.l.c. to establish an independent offshore E&P company. The company is expected to be named Aker BP ASA (Aker BP) and would be headquartered at Fornebuporten, Norway, with Aker ASA (Aker) and BP as main industrial shareholders. In March 2016, BP Plc. and China National Petroleum Corporation (CNPC) signed a production-sharing contract for shale gas exploration, development, and production in the Neijiang-Dazu block in the Sichuan Basin, China. North America dominated the global unconventional gas market in 2017. Asia Pacific is another key region of the unconventional gas market. Disposable income of consumers has been increasing at a rapid pace in Asia Pacific. This is driving the GDP of the region. Rise in GDP is boosting the demand for energy in Asia Pacific. China, India, and Indonesia are the prime contributors to the demand for energy. In terms of production of unconventional gas, China and Australia are the major countries in Asia Pacific. According to the U.S. Energy Information Administration (EIA), China has the largest technically recoverable reserves of shale gas (estimated at 31.57 TCM) in the world. This is 68% higher than the shale gas reserves in the U.S. India is also focusing on the production of unconventional gas. In March 2017, Reliance Industries started commercial production of coalbed methane at its Sohagpur fields in Madhya Pradesh, India. The global unconventional gas market is highly fragmented. Key players operating in the global market are Baker Hughes, a GE company (BHGE), Schlumberger Limited, Royal Dutch Shell plc., Chevron Corporation, ExxonMobil Corporation, Total S.A., Halliburton Inc., Weatherford International Plc., National Oilwell Varco, BP plc., Emerson Automation Solutions, and TechnipFMC plc. Currently, the world is facing challenges of shortage of conventional fossil fuels and degradation of the environment. Unconventional energy resources are being used increasingly to overcome these issues. Unconventional gas refers to natural gas that requires advanced production methods. These gas resources are found in unusual geological locations and therefore require special extraction technologies. Unconventional sources of gas have gained much attention of late due to their significant contribution to gas production in the U.S. There are three major types of unconventional gas: shale gas, tight gas, and coalbed methane. Global production of unconventional gas rose by 5.3% to 817 bcm in 2016 compared to that in 2015. North America accounted for more than 85% share of the total global production in 2016. China is one of the leading shale gas producers in the world along with the U.S. and Canada. In 2016, shale gas production in the country rose by 76.3% to reach a new record of 7.9 bcm. In China, several state departments, including the National Development and Reform Commission, have proposed to promote natural gas exploration in order to make natural gas a major resource in the country’s modern system of clean energy. According to the Chinese Ministry of Land and Resources (MLR), CNY 8.79 Bn (US$ 1.3 Bn) was spent on exploration of shale gas in the country in 2016. Countries such as Saudi Arabia, Qatar, Kuwait, Iran, and Nigeria are concerned about the rapid development of unconventional gas, primarily shale gas. Traditionally, the economies of these countries have been reliant upon the high prices of oil, which is exported to various countries across the world. However, substitution of oil with gas in various sectors, such as transportation, is likely to hamper the GDP of the oil-producing countries. The U.S. and Germany have already started substituting oil with gas. This report analyzes and forecasts the unconventional gas market at the global and regional levels. The market has been forecast based on value (US$ Mn) and volume (million cubic meters) for the period from 2018 to 2026, considering 2017 as the base year. The study includes drivers and restraints of the global unconventional gas market. It also covers the expected impact of these drivers and restraints on the demand for unconventional gas during the forecast period. The report also highlights opportunities for the unconventional gas market at the global and regional levels. The report includes detailed value chain analysis, which provides a comprehensive view of the global unconventional gas market. Porter’s Five Forces model for the unconventional gas market has also been included to help understand the competition landscape of the market. The study encompasses market attractiveness analysis, wherein type and application segments have been benchmarked based on their market size, growth rate, and general attractiveness. 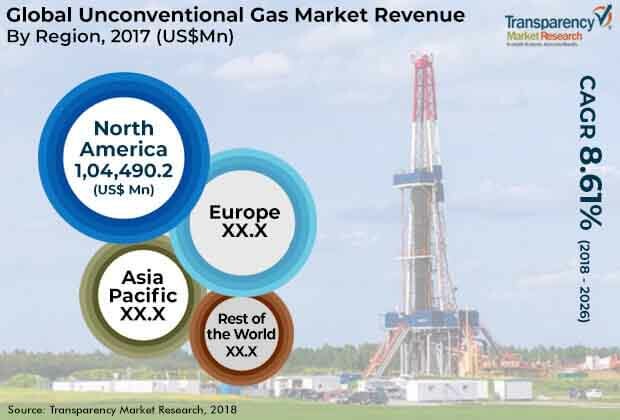 The study provides a decisive view of the global unconventional gas market by segmenting it in terms of type, application, and region/country. In terms of type, the market has been classified into shale gas, tight gas, and coalbed methane. Based on application, the market has been segregated into industrial, power generation, residential, commercial, and transportation. These segments have been analyzed based on the present and future trends. Regional segmentation includes the current and forecast demand for unconventional gas in North America, Europe, Asia Pacific, and Rest of World. The report provides size (in terms of volume and value) of the unconventional gas market for the base year 2017 and the forecast between 2018 and 2026. Market numbers have been estimated based on type, and application segments of the unconventional gas market. Market value and volume have been provided for the global, regional, and country-level markets.